Amapondo # 4, archival ink jet print on Hannemuhle cotton rag, 72 x 113 cm, signed in margin. 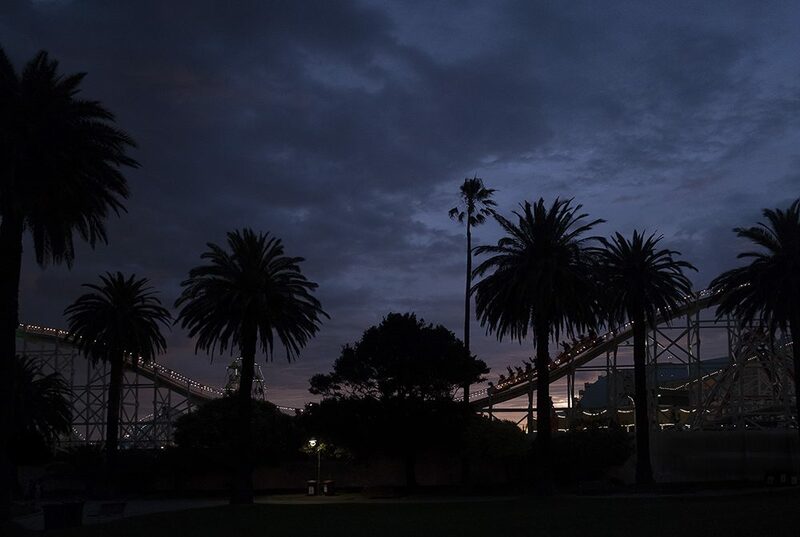 Amapondo is the striking new series by acclaimed Melbourne-based, South African photographer, Christopher Rimmer. 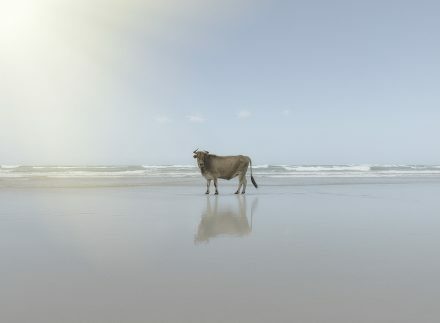 The series comprises twenty large-scale photographs featuring indigenous cattle set against the idyllic backdrop of Port St. Johns Beach on the eastern coastline of South Africa. Central to this series is its title. Amapondo means the people of the Mpondo or Pondo, the land of the Xhosa Kingdom. 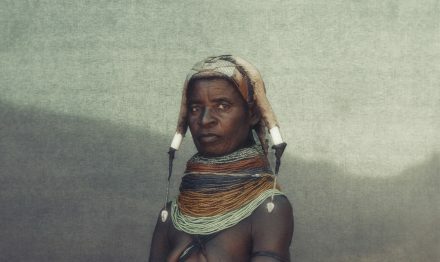 They are part of the Nguni peoples and the area is known as Pondoland. In naming the series, Rimmer wanted to evoke a ‘sense of place’ as it links to the ‘narrative of how it was made’. In historical terms, Nguni cattle were incredibly important to the Xhosa people – economically, socially, politically and spiritually – and there is something of this status and stateliness of the cattle that shines through in Rimmer’s portraits. So valued were the cattle that the Xhosa people wrote poetry about them, depicted them on rock paintings and developed a lyrical and complex naming system for them, describing them by such attributes as colour pattern, fertility and horn shape. Names include inzimakazi ebulumunga (black cow which is the bark of the mimosa tree peeled back) and inyonikayiphumuli (the bird that does not rest). The Nguni, the ‘abundant herds’ were so ‘beloved’, so integral a part of life that the cattle owner would welcome in each day by saying kusezimpondo zankomo (it is the time of the horns of the cattle). Amapondo # 16, archival ink jet print on Hannemuhle cotton rag, 72 x 113 cm, signed in margin. To this day, Amapondo or Nguni cattle frequently participate in a daily pilgrimage to the beach, as seen in Amapondo 20, with the beautifully and diversely-coloured cattle leading the calves down to the water’s edge, their footprints marking the sand. There is anecdotal evidence from shipwrecked sailors that cattle have been visiting the beach in this region from the sixteenth century. 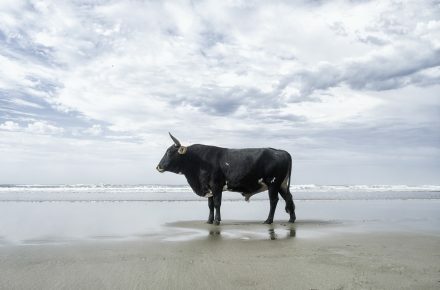 Rimmer said that there are a number of theories as to why the cattle go onto the beach, ranging from removing ticks to the salt water aiding digestion; however, he believes they do it to “…cool themselves in the afternoon sea breezes” in Summer and to warm themselves on the sand in Winter. 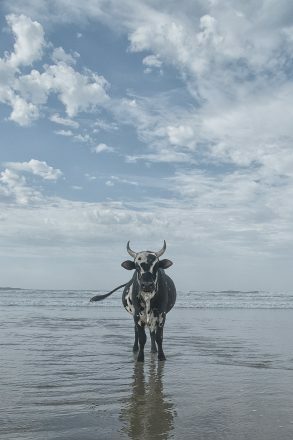 Rimmer’s aim with the Amapondo series was to photograph the cattle in an “unusual and graphically compelling environment.” While it is very unexpected visually seeing cows on a beach, rather than in rolling verdant fields, it is also unusual in reality. 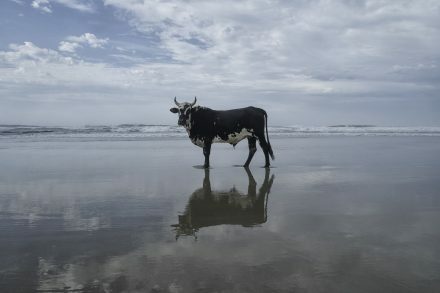 There are cows which sun themselves on the beach at Goa in India (where cows are sacred), but it is not the animals’ natural habitat and there are reportedly only a couple of known locations in the world where cows come down to the beach. In the Amapondo photographs, one is struck with wonderment by the spectacle. Civilization, as represented by the cattle of a sedentary community, has penetrated even the furthest and most untouched places. Amapondo # 6 , archival ink jet print on Hannemuhle cotton rag, 72 x 113 cm, signed in margin. There is a dichotomy in these cattle portraits – on one hand they are reverent and depict the inherent and traditional majesty of the animals, on the other hand they are almost irreverent, with the quirkiness and playfulness of the cattle enjoying the beach. 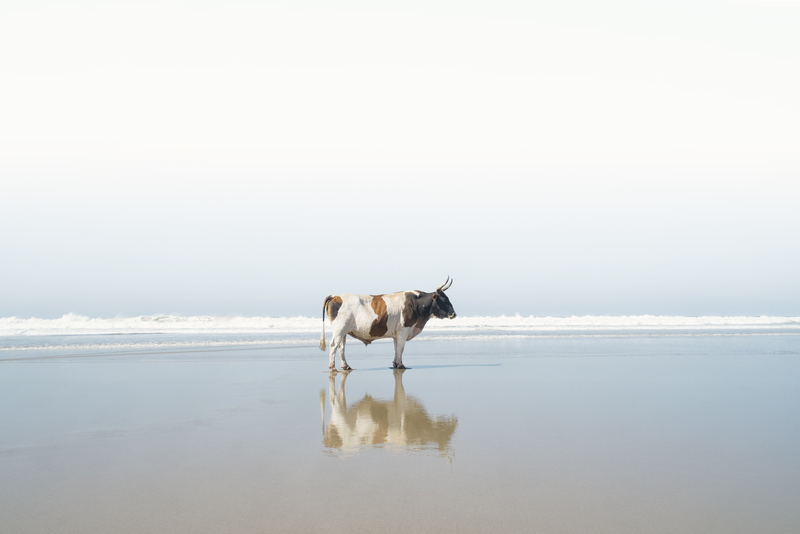 In Amapondo 16, for example, the cow looks serenely happy, tail whisking the cool sea air. 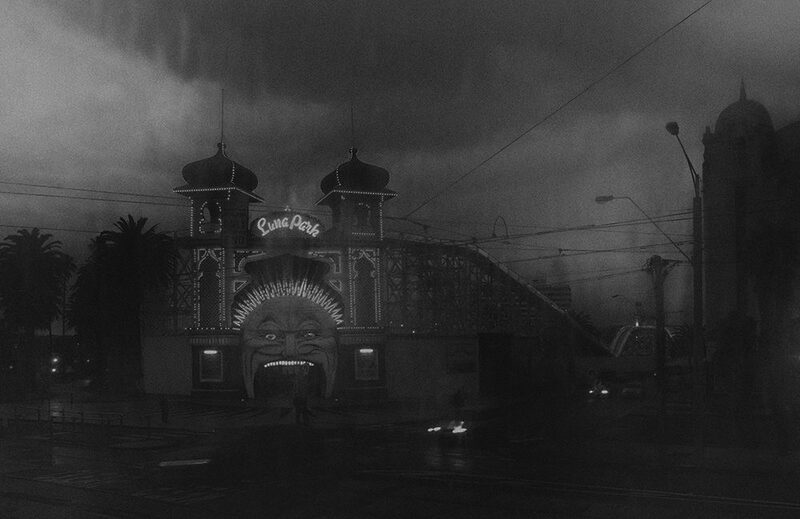 The images are at once surreal, yet intrinsically real and authentic. In European art there is a bucolic tradition of pastoral landscapes depicting herds of cattle grazing in the pastures of the landed gentry or by rivers. Notable landscape painters were John Glover, Claude Lorrain and Jan Hendrik Scheltema. Hathor was a cow goddess worshipped in Ancient Egypt and bovines (bulls, oxen, cows and calves) were illustrated in Medieval Bestiaries (illuminated manuscripts), which also reflected their importance in society, a society based on agriculture and in which cattle were everyday companions of men. The cow in art is therefore imbued with much symbolic value. Rimmer’s portraits are thus richly layered with potent cross-cultural symbolism, a fusion of South African and Western imagery and fundamentally emotive. 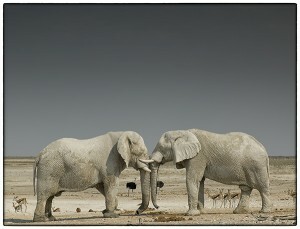 They are also simply stunning, peaceful, even joyful works by a masterful photographer. 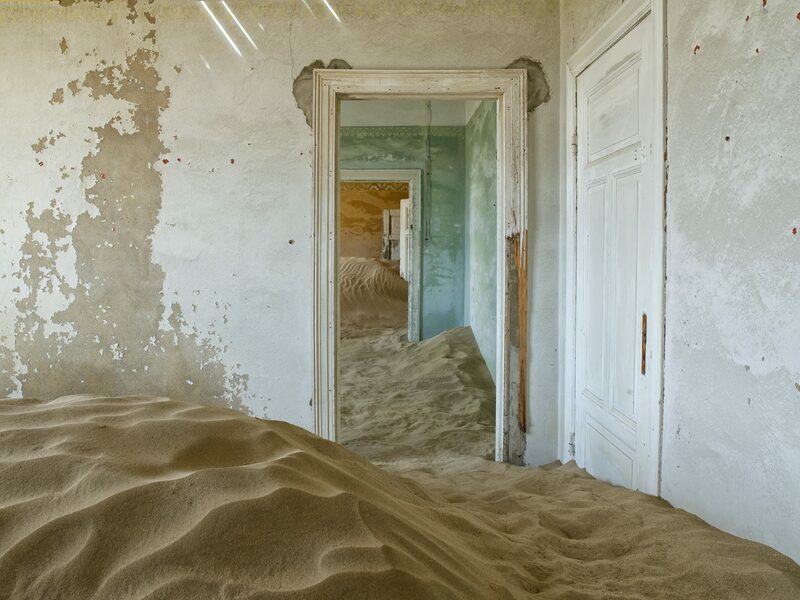 Rimmer is best known for his wildlife photography, although his previous series, Sign of Life, was of the abandoned diamond mining town in Kolmanskop in southern Namibia, which had been reclaimed by the desert sands. As with many deeply creative people, Rimmer has had a scarred life. He grew up in Germiston, South Africa before going to boarding school in Grahamstown, on the Eastern Cape, of which he has unhappy memories. He settled in Australia in 1981 where he now has a wife and two children. It was his childhood filled with darkness that drove the artist back to South Africa in 2009 “…in an attempt to articulate [his] connection to the country and to explore what that connection meant to [him] as an artist, now in middle age, living out of Africa.” This was also an attempt to rediscover or find his remembered or imagined construct of South Africa and to capture this photographically. Amapondo # 2, archival ink jet print on Hannemuhle cotton rag, 72 x 113 cm, signed in margin. In the Amapondo series Rimmer continues to explore questions and ideas about this childhood South Africa, which haunt him. Amapondo possesses a ‘zen-like’ quality and, as such, the photos are the ‘polar opposite’ of his childhood experience of South Africa. He was inspired to drive to Port St. Johns to investigate this phenomenon. Situated in the tribal homelands at the mouth of the Umzimvubu (or Mzimvubu) River, Port St. Johns lays claim to some of the most beautiful scenery in the country. It is also a place populated by an eclectic mix of people who enjoy living ‘off the grid’ in harmony with deep forests and exotic flowers – a ‘natural Eden’. While shooting the series, Rimmer stayed at the Amapondo Backpackers at Port St. Johns, a creatively stimulating place with a wonderful sense of community and owned by his friend. Amapondo took an entire year to make. Shot between two rivers – the Mzimkhulu and Mzimvubu – and initially at Second Beach because of its flat topography, Rimmer spent a total of eight months shooting in South Africa, with a break in the middle while he undertook a job in Bali for a month. 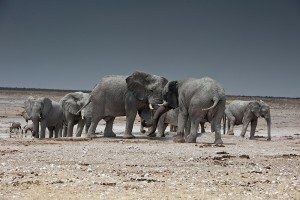 When he returned from Bali in Winter, the animals were less inclined to go down to the beach. Sometimes it was necessary for his assistant to help drive the cattle to the beach and manoeuvre the proud bulls into position, which was not ideal. Some of the cows naturally turned towards the camera – just as the British landowners did in their stately portraits – while others were not interested. No-one knew specifically to whom the cattle belonged. Amapondo # 11, archival ink jet print on Hannemuhle cotton rag, 72 x 113 cm, signed in margin. …see a number of favourable circumstantial and compositional elements coming together to form one of the most memorable images in the Amapondo series. Dull morning light, low tide, a beautiful Nguni bull walking parallel to the beach and the position of the sun creating a perfect and full reflection on the wet sand. As an added bonus, the animal has a branch of ivy in its mouth, which adds to the slightly surreal nature of the image. A pop of artificial light from an Elinchrom softbox on an extension pole brings the subject to life whilst preserving the sky detail. As Ellyn Kail observes, Rimmer “…captures something of the animals’ pathos, their unspoken appreciation for the land and for their lives. Since becoming acquainted with the intelligent and sensitive creatures, he says, he has seriously reconsidered using or eating beef products, discovering in the cattle’s gaze something curiously and undeniably human”; something anthropomorphic. Amapondo was exhibited in New York (Art Expo), Cape Town (Jan Royce Gallery), Munich, San Diego, Miami in 2015 and Melbourne (Angela Tandori Fine Art) in 2016.